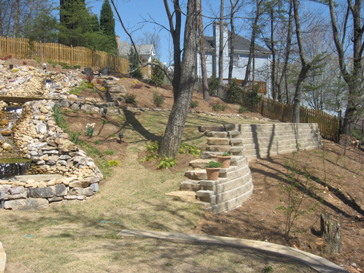 This is another customer’s backyard in Marietta area. The hill did not have anything but rocks and very hard ground. 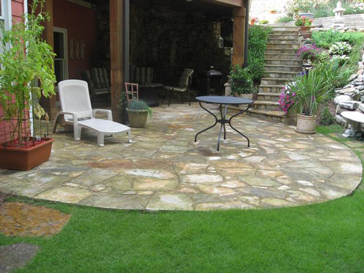 Mr. Dietmar Bogk and his wife wanted to transform the backyard into what you are about to see bellow. 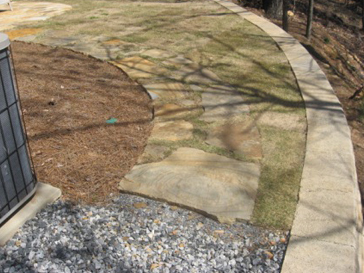 All the hardscape as well as the landscape were installed by American Landscaping Services. 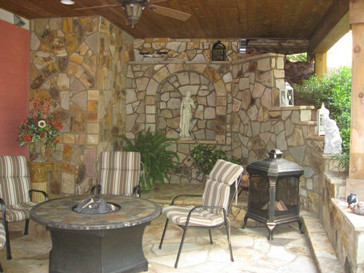 We followed the design and built the backyard as described by the customer. Our designer lead the project all the way from the beginning to the end. 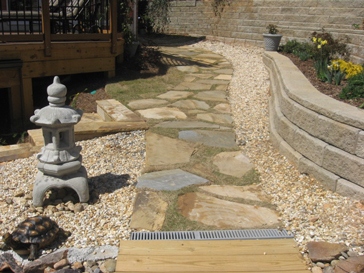 The Allan Block retaining walls were added to give the backyard more room for the flagstone path and flat areas. 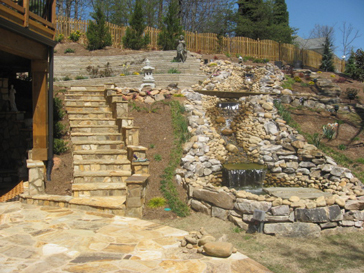 The water feature has 4 ponds and 3 water falls. 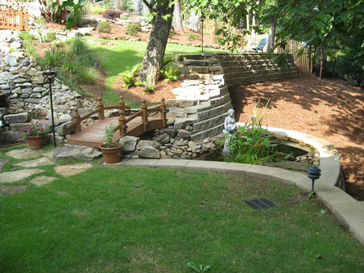 The water feature is approx. 50 feet long. The small bridges were added to allow access over the water stream. 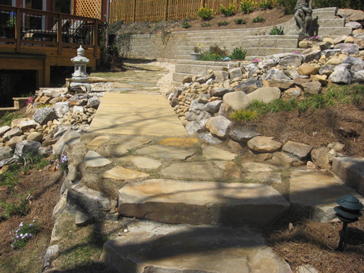 The Flagstone steps allowed acces to the basement area and flagstone patio was added as well. 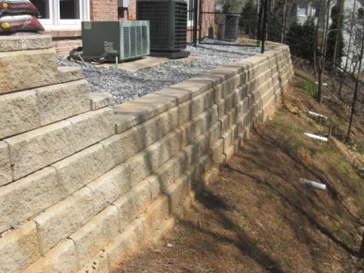 Two more Allan Block retaining walls were added on the right side of the house to control erosion because the hill was too close to the house. We used a big concrete footer and built the retaining wall on top to make sure it would sustain the presure and is been 3 years ever since, and everything is in perfect working condition. 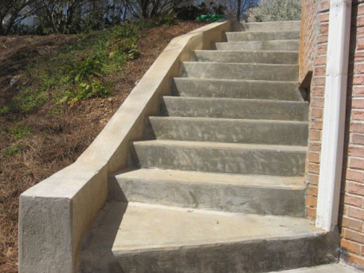 We used solid concrete structure for the steps with rebar to prevent cracks. 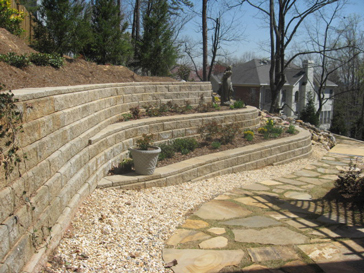 All the drain pipes were added inside the retaining walls for drainage. All down spouts pipes were also buried under the retaining walls with solid 4-inch PVC pipes away from the house. I must say that this project turned out beautifully. Mr. Dietmar has been our customer for more than 3 years. 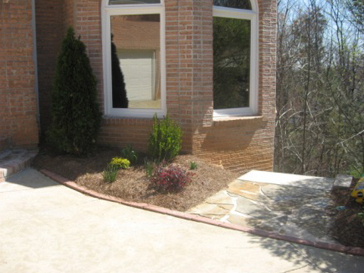 We provide lawn maintenance services to him. 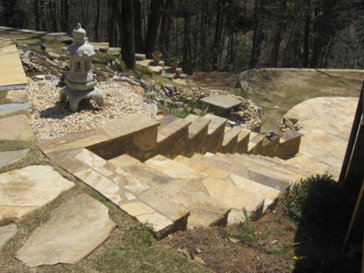 The Flagstone Steps land on a beautiful Flagstone Patio and a Flagstone retaining wall. 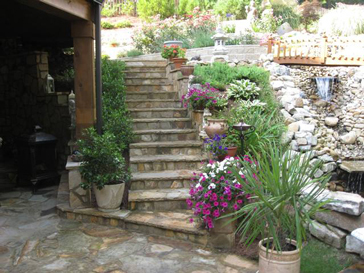 Natural Flagstone Steps – Allan Block retaining walls – Gravel and Zoysia Sod.